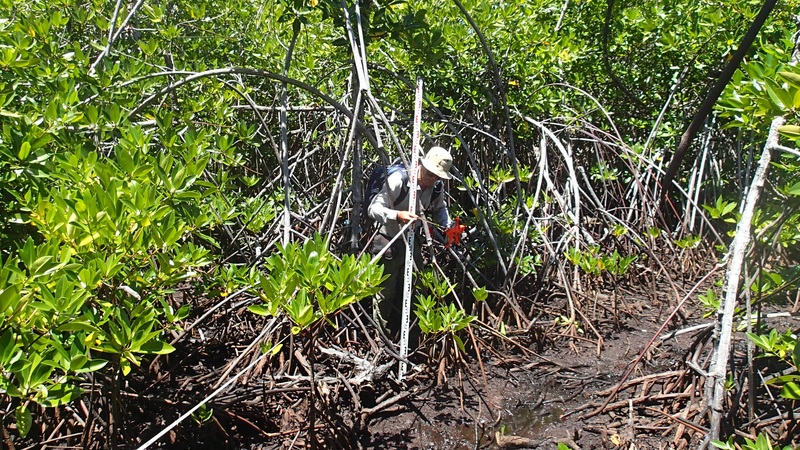 UTIG senior research scientist Fred Taylor helps level through mangrove swamps in the Federal States of Micronesia. Cores from swamp sediment will help researchers determine past sea level changes in the Mid-Pacific regions, which can in turn provide valuable perspective on future sea level rise. Rising sea level is, and will be, an issue facing coastal regions, including Middle Pacific islands, for the foreseeable future. Scientists are trying to assess the magnitude, rates and geographic distribution of future changes in sea level, but many uncertainties exist. Valuable perspective on future sea level rise is based on past sea level changes, and how they relate to various forms of climate change, such as ocean temperatures, ice volume on land, wind/current patterns, and natural climate cycles. However, there are large gaps in our knowledge of important details of both global mean sea level and regional Pacific sea level. The JSG seed grant program funded a research proposal, with UTIG senior research scientist Fred Taylor and UTIG research associate Jud Partin as principal investigators, to find out if high-precision paleosea level records exist that would enable us to address the matter. Taylor joined forces with co-investigators Andrew Kemp (Tufts University) and Simon Engelhart (University of Rhode Island) in the Federal States of Micronesia (FSM) to conduct an assessment of paleosea level data from the field. “The FSM is a particularly good region to get a global sea level record because its sea level responds to changes in ice volume on continents regardless of its geographic sources,” explains Taylor. 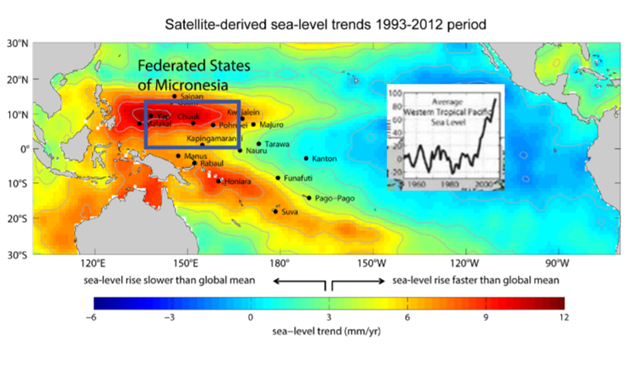 Evidence suggests that sea level in the FSM region has risen about 1.5 m over the past few millennia; this includes a ~20 cm rise since 1993, likely due to an intensification of the trade winds associated with a climate cycle: the Pacific Decadal Oscillation (PDO). However, critical details of the timing, rates, and relationships to climate and terrestrial ice volume are very poorly understood, especially prior to the latter part of the 20th Century when tide gauges and satellite measurements became common. 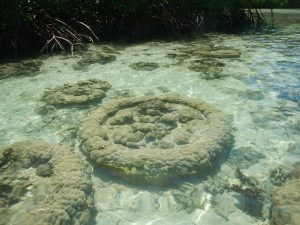 The research proposal exploits two main methods of paleosea level reconstruction: coring swamp sediments and cross-sections of coral micro-atolls. 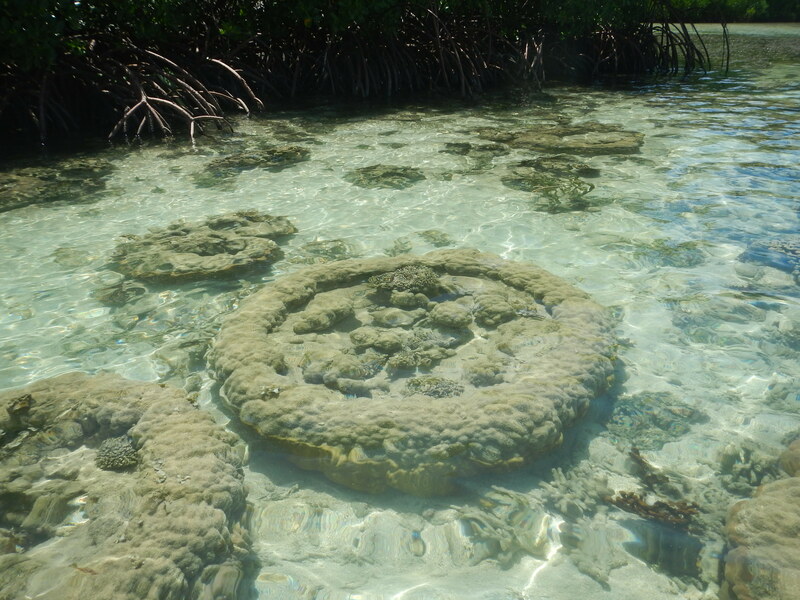 Mangrove swamps on volcanic islands in the FSM harbor organisms that are very sensitive to sea level. Modern statistical methods and radiocarbon dating can provide determinations of paleosea levels as precise as 10-20 cm and of time within 100-300 years. Coral microatolls serve as living tide gauges that live on the shallowest reefs and record sea level with a precision of better than ±10 cm. They can be precisely dated to within less than one percent, and can survive for up to several hundred years. “Microatolls grow up and down through time in response to changing sea level. Our leveling of 50 coral microatolls shows that their highest living surfaces vary in height (relative to sea level) by an average of only ±2 cm,” Taylor says. Samples can be obtained by sawing two parallel cuts from the periphery to the center to remove a slab of the coral. The slabs are X-rayed to show the annual density bands (like tree rings) and the record of how the corals grew upward and died downward as sea level rose and fell. 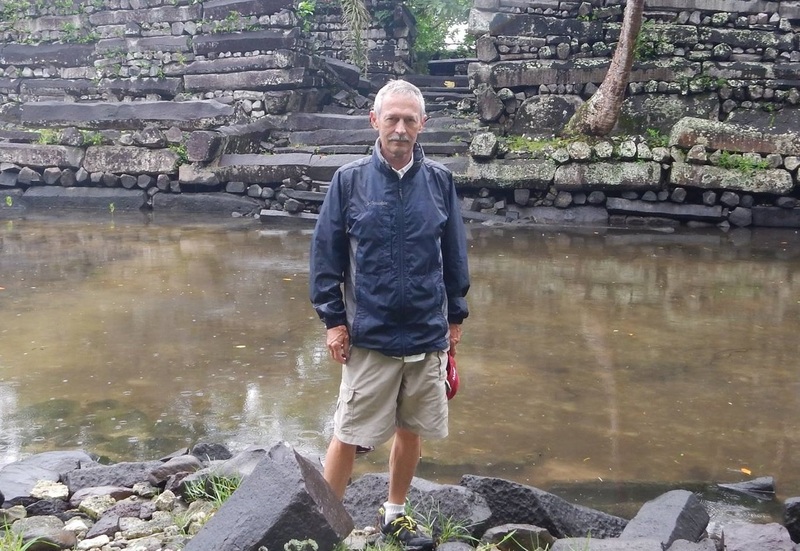 Fred Taylor has been visiting and working in Mid-Pacific islands, including the FSM, since the 70’s. 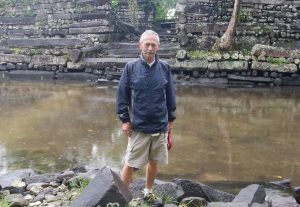 Here he is pictured at Nan Madol, the World Heritage Site of artificial islands constructed of columnar basalt logs, on the island of Pohnpei, FSM. The researchers are hopeful of receiving funding to obtain these samples and ultimately show a record of time vs elevation of sea level over the course of the past few thousand years. Having visited the islands for many years, Taylor understands the pressing nature of the issue of sea level rise for the locals. “All pacific island nations, including the FSM are very concerned about sea level rise and climate change. We want to collaborate with the local authorities and have been welcomed and accepted by the state governments, fisheries departments and non-governmental organizations. This is a very pressing and current problem for the locals and is affecting things like roads and infrastructure,” he says.